I've been interested in the combination of stairs and ramps for quite a while now. In an earlier post (Fun fact: My second most popular post of all time, with 2192 individual views) I described and showed a design where a ramp was transplanted into a flight of stairs next to a very small park in Oslo. I've employed the same technique in a public space project at school, but I also find other solutions to be interesting. By mere coincindence, I found the blog of architect (student?) Samuel Lima from the University of Notre Dame in Indiana. 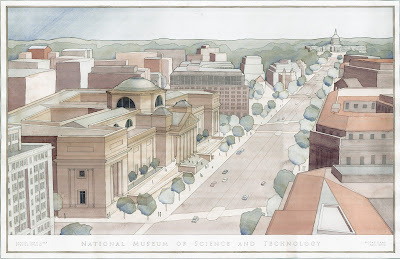 A talented drawing artist and designer, all his work has a very classical look, including this project for a new "National Museum of Science and Technology" for a site in Washington DC. What is less traditional, however, is the incorporation of two huge, symmetrically placed ramps on the main facade. They seem to be made out the same material as the rest of the building, and follow the rhythm of the architecture in a way that actually seems to work very well. I don't know if there were any precedents, or if he just pulled this out of his sleeve. He definitely solves the problem in an interesting manner, but I do that wish people who sit in wheelchairs or for other reasons need to use the ramps, could join the other guys in hanging out in what is sure to be a very friendly and informal space on and around the landing in the middle of the stairs. 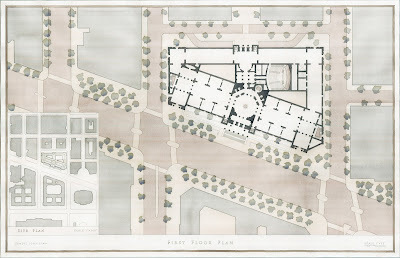 A cool feature in the plan is how the use of colour signals a transition from pavement, in a sandstone-like tone, towards the building itself, in white, perhaps illustrating the change from very public to slightly less public, or how a ramp can feel like a street and a part of building at the same time. Another question this project raises, is whether we actually need to build entrances and stairs like these. Lima wrote in an email to me: "During the design critique, the accessibility of both my design as well as well as my classmates' designs was a hot topic. 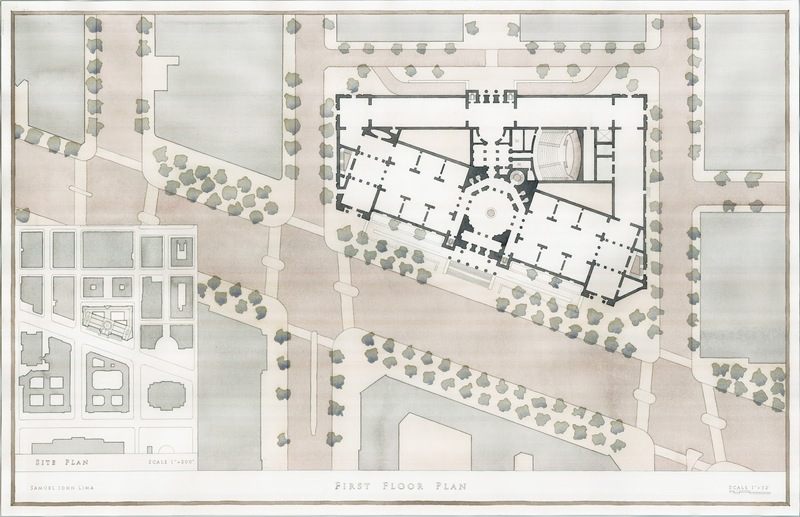 The jurors debated whether or not monumental stairs have a place even in the most monumental buildings." Some people seem to think of these sort of stairs as nice and a bit out of the ordinary places to sit down and meet others, while other people may think they are just an expression of power. (I'm in the first group, but I think many of my teachers at BAS are in the second.) They also take up a lot valuable space in the city, which has to be justified in one way or another. 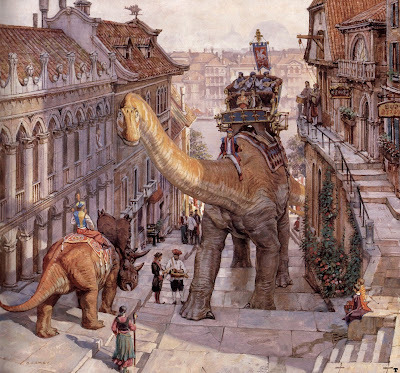 However, if we do need them, I think it's very appropriate to incorporate ramps as well, as a part of universal design, although that takes up even more space. What do you think? Personally I agree that entrance stairs can look good, they can give a building a grand and classical look. However that's the only good thing about them in my opinion. If you have the entrance on ground level you can use the space you'd otherwise use for those big stairs as a decorative area with benches and stuff. That is, a sitting and meeting area that would be accessible to all people - disabled too! Ramps are a great improvement in accessibility in many places but still don't provide accessibility for all. Some people who are not wheelchair bound have difficulty with both stairs and slopes (and thereby ramps). If stairs and ramps are used then at least make sure to have handrails in two different heights, one suitable for people in wheelchairs and one for walking adults. If this building in the pictures above was built now as an official state building (city hall, tax office or any such place that everyone should have good access to) I'd be furious. As a museum I guess it's not that problematic because one doesn't 'need' to go there. Internal staircases reduce the connection between upper stories and the life of the street to such an extent that they can do enormous social damage. Do away, as far as possible, with internal staircases in institutions. Connect all autonomous households, public services, and workgroups on the upper floors of buildings directly to the ground. Do this by creating open stairs which are approached directly from the street. Keep the stair roofed or unroofed, according to climate, but at all events leave the stair open at ground level, without a door, so that the stair is functionally a continuation of the street. And build no upstairs corridors. Instead, make open landings or an open arcade where upstairs units share a single stair. On my old computer I've a beautiful picture of this pattern, maybe I add it someday if I'll use it again. Surely buildings supporting classical liberalism need to have a more "classical look"! While for some classical columns are an expression of power, for me they are an expression of an old tree. But of course, a mighty tree possesses a mighty power too. >"Mist, why do you think official buildings shall have no life? Is it because you support modernist liberalism, as modernist architecture is the grim face of the modernist-liberalist-state:"
Eh? I just want official buildings to be accessible to everyone and if you put stairs in front of them they aren't! Simple as that.